Battle Arena 2 for Injustice: Gods Among Us has concluded. See who the fans voted for in match-ups between The Joker and Lex Luthor and The Flash vs. Shazam. 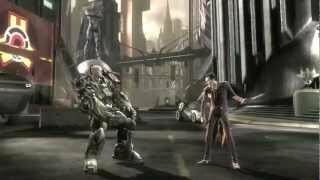 InjusticeGame has posted the results of Battle Arena 2. Today (Feb. 15) sees who reigned supreme in two high profile bouts. The Joker met with Lex Luthor, while The Flash battled Shazam. Though the Injustice: Gods Among Us gameplay is predetermined, it doesn't fall short of showing off the mechanics. WB Games and NetherRealm's inaugural Battle Arena pitted Batman against Bane and Wonder Woman vs. Harley Quinn. If you missed the first Battle Arena results, click here. Here are the Battle Arena 2 results.